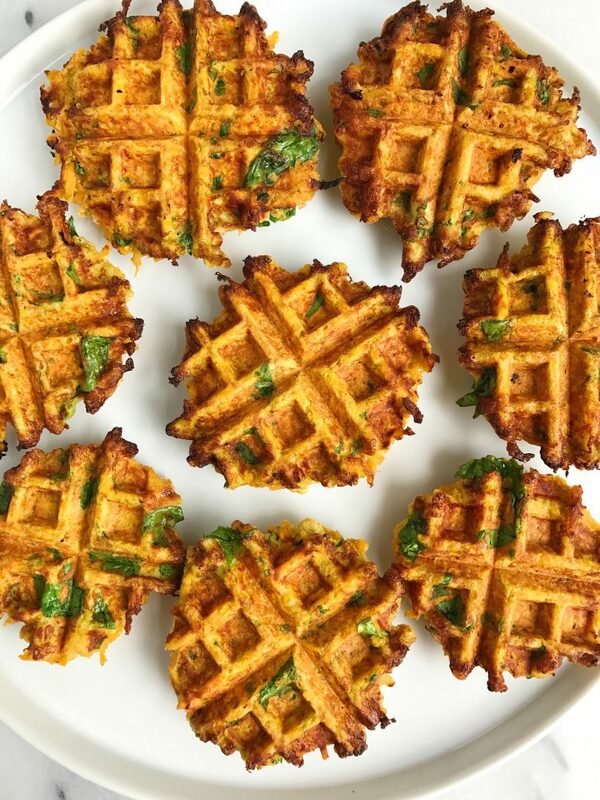 Savory Paleo Veggie Breakfast Waffles made with coconut flour for an easy veggie waffle! The excitement over the zucchini waffles fritters had me itching to try even more savory waffles in the kitchen. 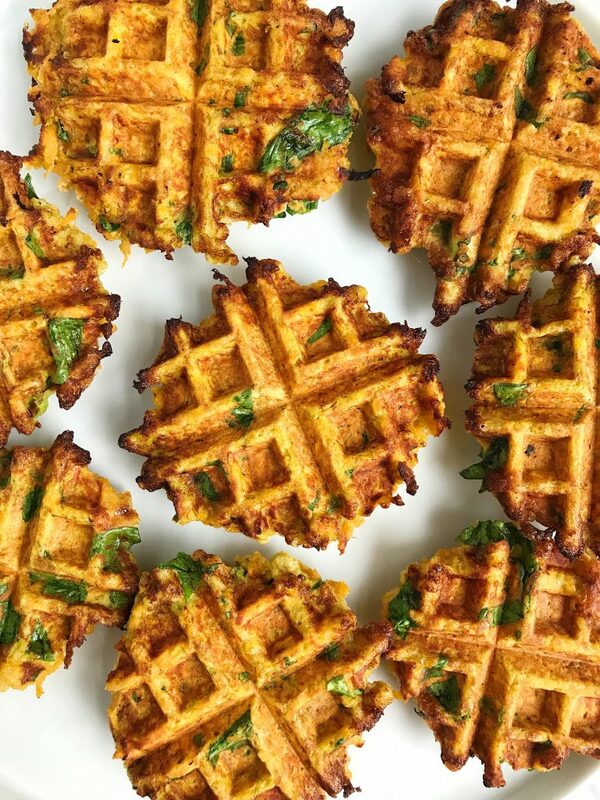 These Paleo Savory Veggie Waffles are SO GOOD you guys! They are so underrated and so flavorful and easy to make! I love making the zucchini ones but also am loving these sweet potato ones. They are amazing with some fried eggs on top or even to make a waffle sandwich with! They are paleo so no grain, gluten or dairy in them! I use coconut flour, eggs, and even snuck in some greens in there. I use Organic Girl Baby Spinach to get some extra veggies in the serving. 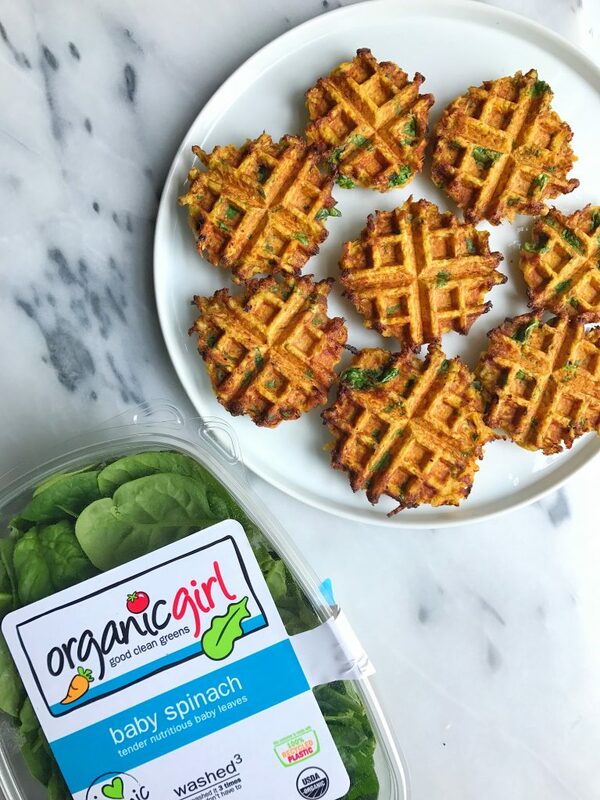 I personally am not the best at having greens more than once a day, so sneaking them into recipes like these waffles are such an easy way to eat them. You can really use any of Organic Girl’s greens in them but the baby spinach was delicious in them. These waffles also turned out extra crispy because I greased the waffle maker with avocado oil. This obviously optional but I like a little extra crisp with these to make them more fritter-like. Make sure that you use sweet potatoes that are not roasted! I just used grated sweet potato from washed and uncooked sweet potatoes. I have not tested these with cook potatoes and I do not think they will work as nicely! When you make these, they do stay good in the fridge or freezer so no worries if you have left over. I froze a bunch of them and it was like an easy sweet potato hash brown to enjoy when we defrosted/reheated them on the stove. This is our new favorite breakfast! So simple and so yummy! We topped ours with fried eggs and a shredding of cheese. The next batch is going to be with cinnamon and pecans and copious amounts of butter and maple syrup. They’re so versatile. Thanks for the recipe! So is the sweet potato grated raw? Or do you bake it and then grate it? Hello! So you think I could sub the eggs for fax eggs? OK, this recipe is brilliant. I have to admit, I was skeptical that these things would hold together and the sweet potatoes would be fully cooked when I looked at the finished batter, but they came out beautifully soft on the inside and crunchy on the outside. I’ve been searching for a way to make sweet potato latkes since I started eating paleo several years ago. I never thought to use my trusty waffle iron. Thanks for this awesome recipe! Great recipe Rachel. Which waffle iron do you use? my partner can’t eat eggs, is there any other substitution u would recommend that doesn’t include flax?